Class S winner Grace Hanratty of Old Saybrook pulled away from the field to win in a time close to her season's PR that she set the week before. S runner-up Cassandra Carleson of Plainfield followed up up in 2nd at 3:00.41, and LL's 4th-place finisher Grace Sparrow of Glastonbury got back closer to her season's best while taking 3rd in 3:01 while winning the first section of the 1000m. Hanratty's OS teammate Jessica Stratton was 4th and was also in first section like Sparrow, and Sydney Schultz of Ellington and Kate Hedlund of Manchester were 5th and 6th. Reigning champ Lauren Moore of Danbury fought off a late challenge by Class M winner Kathryn Rodrigues of Wolcott to take the 1600m again. Zoe Harris of Greenwich, Stephanie Queiroz of Danbury, and Tess Pisanelli of Ridgefield were packed in close together for the 3rd through 5th spots, and Class S champ Taylor Mascetta of Immaculate finished out the scoring in 6th. Top seed and LL winner Mari Noble of Greenwich left nothing in doubt as she ran away from LL runner-up Daniella Grullon-Pena of Danbury to win by more than 10 seconds. 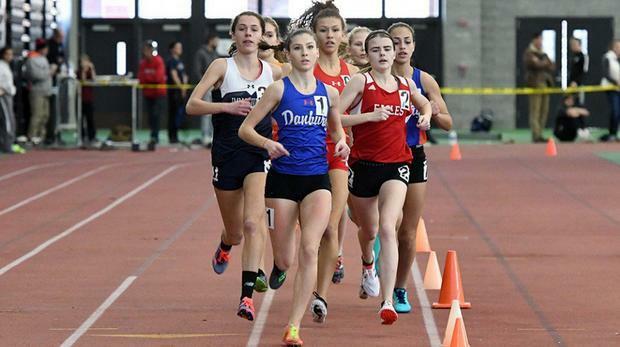 Manchester's Kate Hedlund added another scoring place in addition to her 6th in the 1000m as she took 3rd in the 3200m in 11:12.40, and there was a close finish behind her for the last three scoring places as Caroline Webb of Greenwich was 4th, Rhiannon Richmond of Avon was 5th, and Ava Graham of Bethel was 6th.